You'll find money-exchange counters at the airport and in major tourist areas. 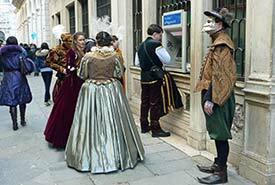 However, you're likely to save money by using your ATM card to get euros from Bancomat machines. Bartenders. Tipping is entirely optional in bars and cafés. If you're seated at a table, you can tip the waiter or waitress as you would in a restaurant; if you're standing at a counter, you can give a modest tip to the bartender or barista (for example, when handing over your ticket for a drink or coffee in traditional Italian bars where you prepay at the cashier's desk).